Implementing a 5S project is a commonly used improvement method. However, its effectiveness in many businesses leaves much to be desired. To fix these issues, StreamLiner lets you implement 5S best practices. To help you, you can download a 5S template at the bottom of this article. I personally like 5S principles very much. It is simple, it is quick to get started with and (most importantly to me) it helps to get the improvement conversation with your team initiated. 1. Sort - declutter the working area (physical or electronic). 2. Set in order - re-organize the contents of your working area for safety and efficiency. 3. Shine - put some pride back into the workplace and give it a clean. 4. Standards - agree and describe how to leave the area when completing the work, and any routine actions that need to take place (in particular maintenance and filing type actions). 5. Sustain - decide on how you want to periodically check on the working area so that you maintain the standards. Most businesses are pretty good at following the first two or three steps of the 5S principles. Many fail to decide on the standards and most fail to sustain the whole approach. StreamLiner allows you to quickly evaluate your business from a 5S perspective. We've included a scoring system into the software so that you can review an area of your business based on the 5S items most businesses consider 'good' to be. The software even allows you to change the scoring system, should you have some previous experience of 5S and already have defined views of the 5S best practices for your business. 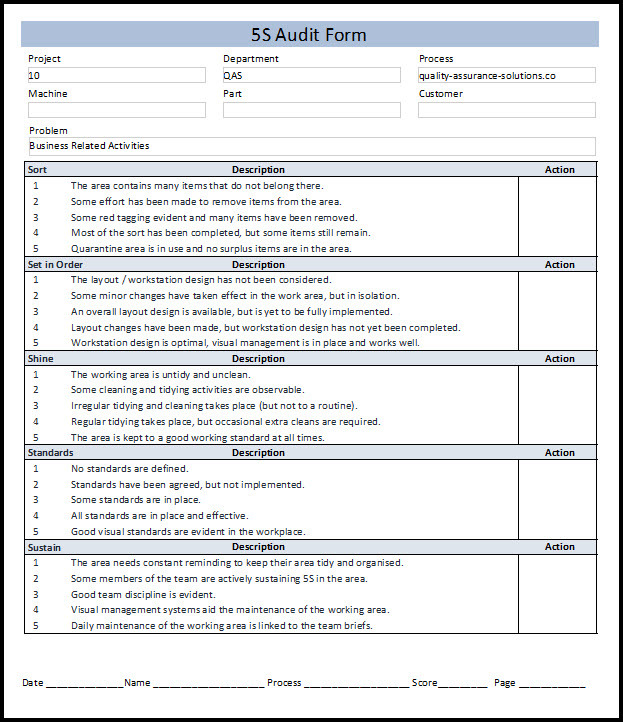 Conducting the evaluation is easy; print off the ready to use scoring template and then go for a walk around the area (or server) in question. When you finished your review you quickly load the results into the StreamLiner software. Why would you do this I hear you ask? Built into all of the main tools in StreamLiner is the ability to generate improvement actions directly from any of the observations you make during 5S or any of the other tools present in StreamLiner (including waste walking, auditing, process analysis, meetings and more). By taking just a few minutes of your precious time to capture the findings from your 5S review you can use the software with your team to generate improvement actions. And this is where the fun really starts! The StreamLiner software pivots around a really simple, yet powerful, actions management tool. Every action you create within the software can be quickly evaluated (so that you can prioritize actions based on the biggest return on your efforts) and then managed centrally. This means that you can manage the improvement projects in your business in one place and not need to have multiple improvement plans dotted around your office or business, confusing you and sucking your time away from actually executing the plans. The actions that your created during your 5S review can become just one part of an overall improvement plan and you can use our pre-loaded template to help you identify what you need to do to make 5S effective within your business. Try out StreamLiner today and see just how easy it is to get your 5S project back on track and use it to also manage your wider business process improvement projects. 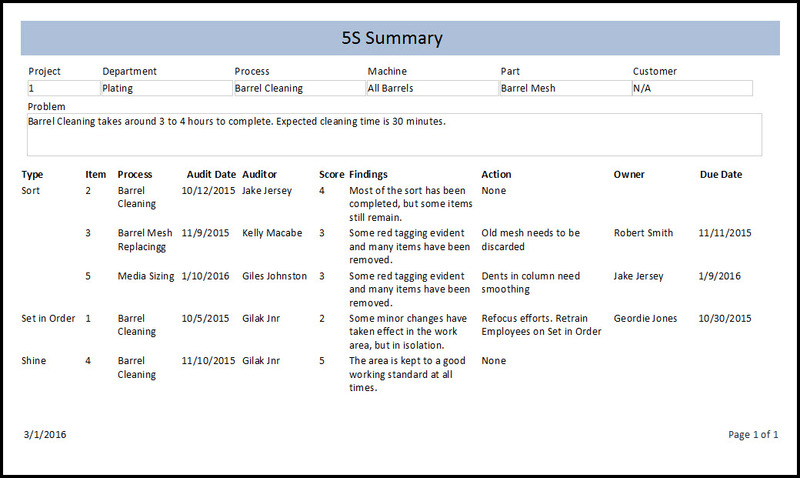 Download a 5S template for 5S audits.